It's been a while since I set a Saint Patrick's Day table, so I decided to get out the Franciscan "Ivy" dinnerware, thinking the green would be just perfect for such an occasion. 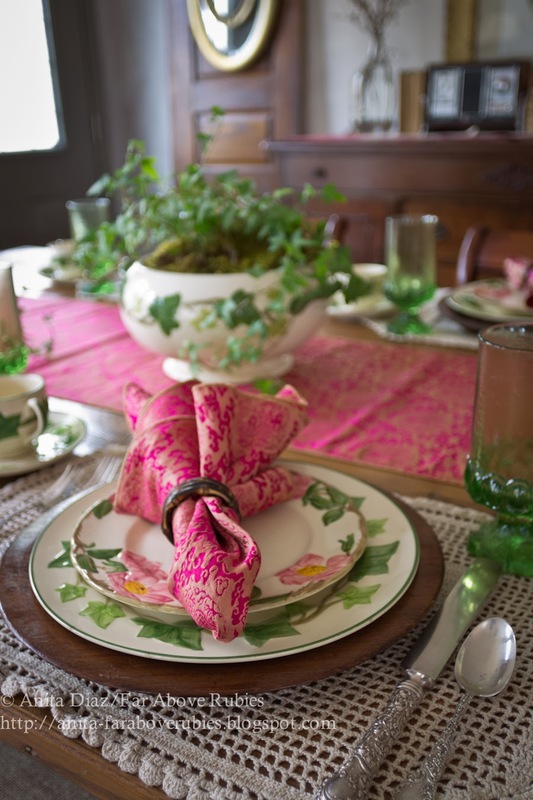 I love using Franciscan "Desert Rose" with the Ivy, and decided the hot pink napkins and runner I made from vintage Chinese silk would jazz it up a little. Ok, a lot. It's only fitting I use crocheted place mats my maternal grandmother made for me -- she is the one in the family with Irish heritage. Franciscan "Madeira" glassware, gifted by my mother, adds the perfect emerald green touch. Gorgeous, Anita! Your Franciscan Ivy is perfect for St. Patrick's Day, and it looks wonderful highlighted by the bright pink! Oh so lovely!! Thanks for sharing!! Wow, Anita, your table is beautiful. It will receive many pins. Looks like a magazine. Your placemats are indeed a treasure because your grandmother made them and they are extremely lovely. 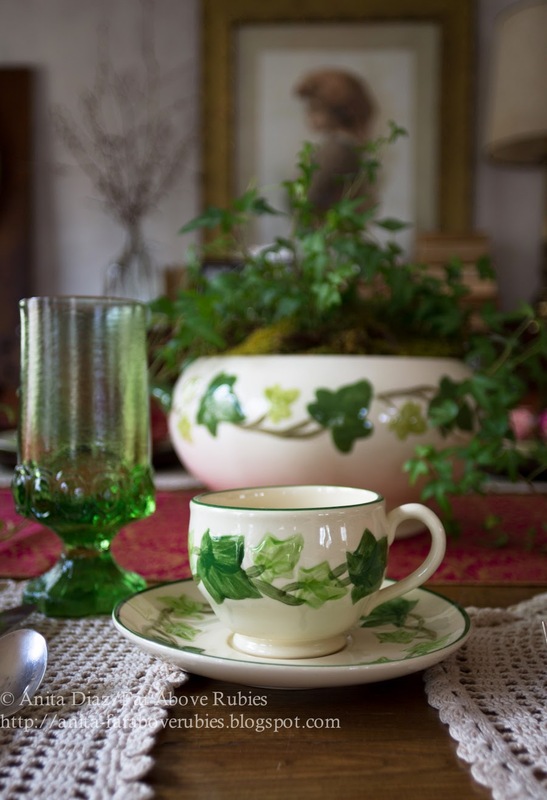 Using your ivy dishes was ingenious for St. Patrick's Day and accenting with the pink was creative too. Did you stand in a chair to get the great overhead shot of the place setting or can you do that with a tripod? Showing my ignorance here! Everything you touch is so beautiful, Anita! I love pink and green together, but what a great idea for St Patrick's Day. 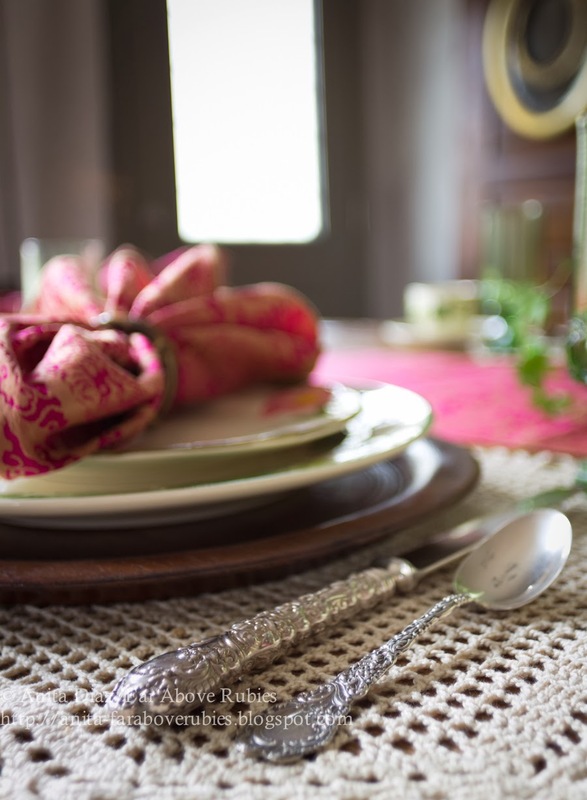 You've got the most gorgeous glassware collection and the flatware is stunning! I don't recall seeing the Ivy dishes before (I love ivy too), but they look great with the Desert Rose! Two holidays I'm working...St Patrick's Day and Easter :(. So beautiful, warm and inviting. I love the antlers in the dining room too…what a neat wall mount they are on. 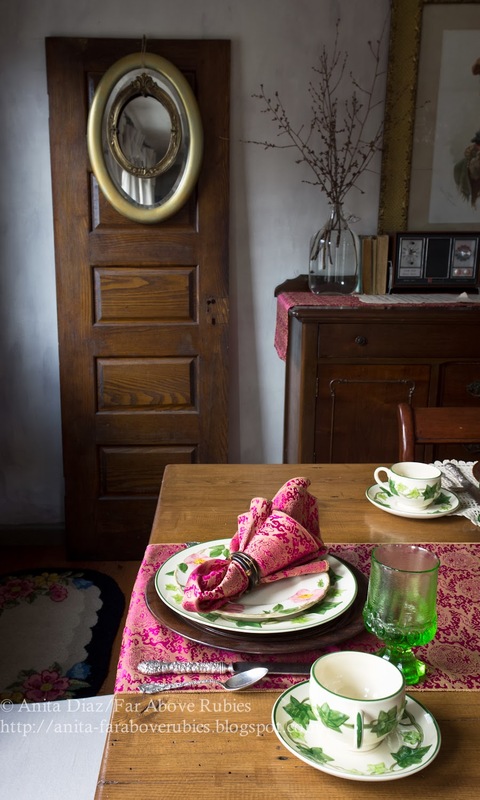 Beautiful Anita, I love the placemats, hand crocheted, the combination of Desert Rose,Ivy and your gorgeous deep pink linens.My mother's wedding china, Desert Rose. Thank you for always sharing your home with us and inviting us to treasure our family heirlooms and most importantly family. Happy St. Patrick's Day, and Spring! Oh, Anita, I love this post! Pink and green is my favorite color combo...and my sorority colors! The ivy is also our symbol; along with the pink tea rose. Your table is absolutely beautiful! I love it all! Absolutely gorgeous, Anita! I haven't posted in forever, but I still have to look at your beautiful home! Happy St. Patrick's Day! I would have never thought of putting these 2 patterns together and they are great! Lovely table. Your dining room looks wonderful. 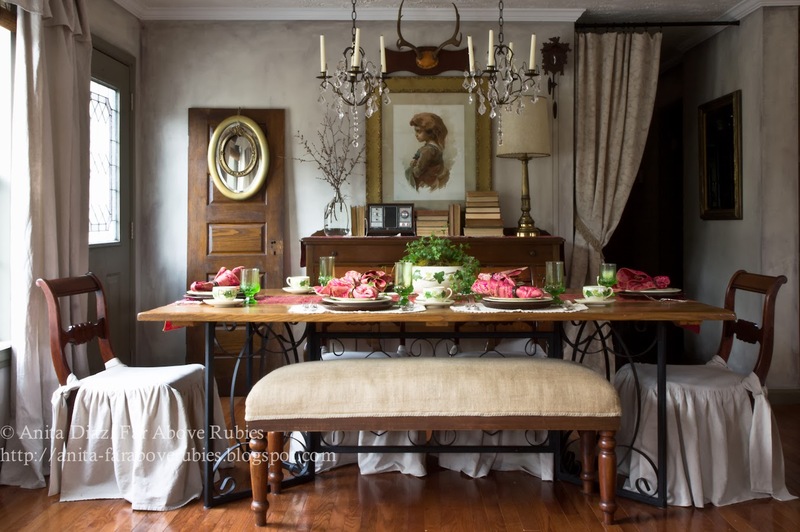 The slipcovers are so elegant and I love the way you mixed the dinnerware! Oh, YEAH, the pink jazzes it up A LOT!!! I LOVE IT!!! I am a pink and green lover from way back, and this is primo!!! What a cool way to infuse a little femininity and uniqueness into the St. Patrick's look! Stunning! I love desert rose! So elegant. Your styling is impeccable! Anita, your table setting is lovely, and the dining room table and seating is gorgeous. I love the mix of pink and green. Well done! Your dining room is dreamy. I love everything about it! So pretty.... I have almost purchased some of the ivy a couple of times. I just love it! The next time I see some I might just have to pick it up! Hope you had a great St. Patty's day. 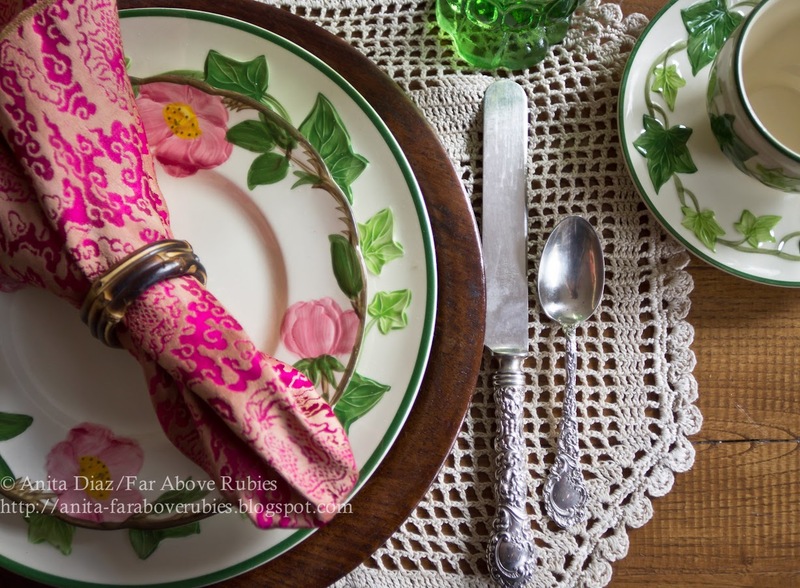 Pink and green come to your beautiful tablescape with spring in mind, Anita! Desert Rose is a classic china pattern, and the mix and match of china patterns shows such personality and charm. Just lovely! I wrote a long comment and lost it. I seem to be doing that more and more. Will try to duplicate. Love your Dessert Rose and Ivy Franciscan together. Your kitchen has some much charm and personality that reflects both your sweetness and artistic flair. What a treasure to have your parents next door. I lost mine while I was in my early thirties so I couldn't help but get choked up thinking about how special for you to have yours so close. Then I started listening to song on your sidebar. You sing beautifully. I also reread your bio ( it's been several years) and started thinking about what an interesting and rewarding life you have lead traveling sharing your talent. I've digressed! 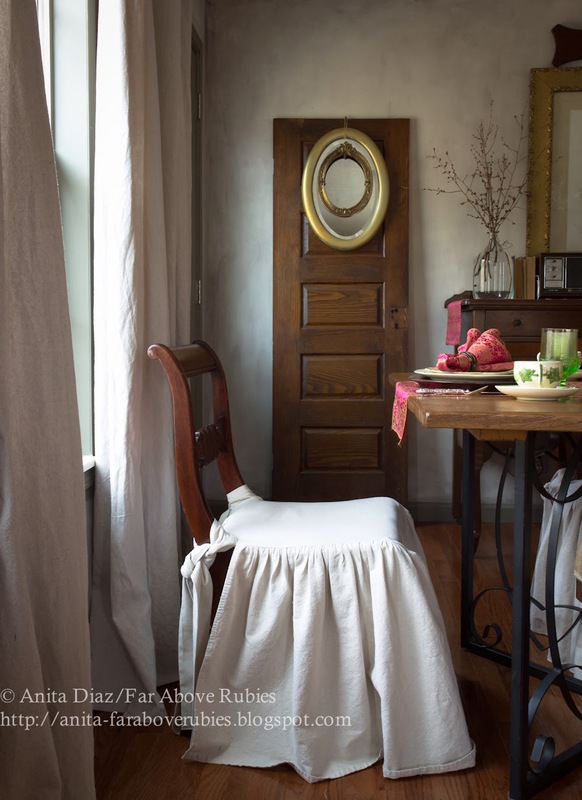 Your post is lovely and inspiring.I love your bar stool covers and your round etched vintage butter dish spoke to me too. Your tray vignette is lovely. What are the ages of your children? You do have a busy life!! Oh Bonnie:-) Thank you for that comment. Our children are 7, 12 and 14. The little guy will be 8 in April. They are growing so fast it makes my head spin. Not sure where I got a teenager from because it was overnight. I am so blessed to have my parents next door...they are such a blessing and to be on the "home place" is really special to me. The butter dish belonged to my mom's aunt, and when I started making butter I realized I needed to use that one. The bar stool covers I made and find that washing them makes me crazy. I should have made two sets! They chairs are in bad shape so I have to keep them covered. I had the Ivy pattern as my everyday dishes when I married 50 years ago. I loved it so much and little by little it got cracked or broken. Loved seeing your beautiful blog.